Attention is given to Biblical Principles regarding the church and its ministries and offices, with special reference to the ministry of the Word. The students receive a brief introduction to the various subdisciplines such as Homiletics (study preaching), Liturgics (study of worship), etc. Fall Semester. This is an introductory course in the principles, history and practice of preaching, with special attention to important themes in Reformed homiletics such as Catechism preaching and redemptive-historical preaching. The students are introduced to the sermon preparation process. By the end of the course each student is expected to prepare and present a sermon proposal on an assigned passage. Winter Semester. Introduction to the study of Catechism teaching. The course consists of two modules. Module 1: Biblical and theological foundations of Catechism teaching (instructor: Dr. A.J. de Visser). Module 2: the adolescent learner (instructor: Dr. C. van Halen-Faber). Presentation and evaluation of sermon proposals. 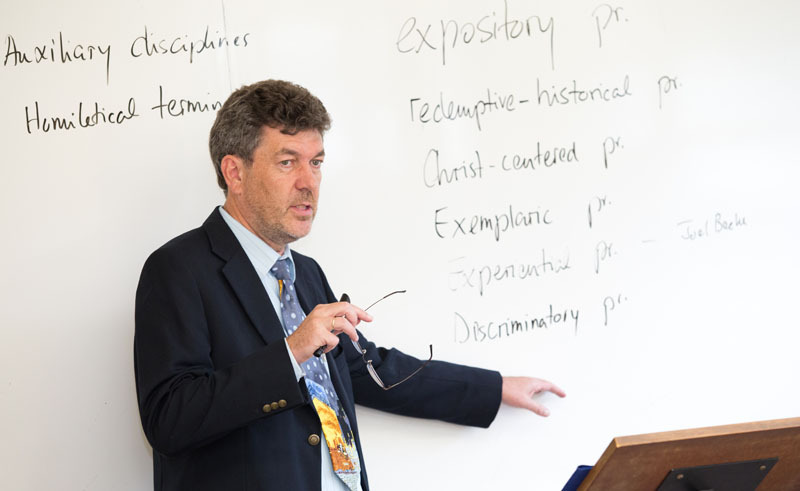 Students are expected to present three sermon proposals in class (OT, NT, and Catechism). Fall and Winter Semester. A study of the principles and practice of pastoral and diaconal care in the Christian congregation. This includes a discussion of the role of the offices of elder and deacon in the church. The course includes a discussion of various approaches to congregational development. Winter Semester. The first half of this course is a study in World Religions, focusing on religions that have a significant presence in Canada (Islam, Hinduism, Sikhism). The second half of the course is a study of the principles, history and practice of evangelism (home mission) and church planting. Fall Semester. A study of important themes in Homiletics: redemptive-historical preaching, covenantal preaching, Catechism preaching, and history of preaching including recent developments in Homiletics. Winter Semester. A study of the principles, historical development, and practice of the worship service of the Christian church, with special attention to liturgical practices in the Reformed tradition and an excursion into the field of hymnology (the study of singing and music in Christian worship). Winter Semester. Presentation and evaluation of sermon proposals. Students are expected to present three sermon proposals (OT, NT, and Catechism). Fall and Winter Semester. A course in world mission. The course introduces the students to Biblical and theological principles, history, and practice of global mission work. Special attention is given to issues such as contextualization, syncretism, relationship with young churches in the Third World. Fall Semester. A study of aspects of pastoral care in the Christian congregation. Complex pastoral situations are discussed (depression, sexual abuse, pre-marriage counselling, etc.). Attention is given to cooperation with professional care givers such as social workers and psychologists. Winter Semester. Theory and practice of Catechism teaching. The course consists of three modules, spread out over three years of study. Module 1: Preparing and delivering Catechism lessons (instructor: A. Gunnink). Module 2: Special topics & classroom management (instructors: A. Gunnink, Dr. C. van Halen-Faber). Module 3: Content & curriculum (instructor: Dr. A.J. de Visser). This field education program is designed to equip students in the M.Div. program for core responsibilities of the ministry such as preaching, teaching, leading worship services, and pastoral visitation. The program consists of four components: an orientation internship (after the 1st year of study), a Catechism teaching practicum (during the 2nd year), a mission/evangelism internship (after the 2nd year) and a summer internship (after the 3rd year). This course consists of five modules which are spread out over the four years of the M.Div. program.